A project manager’s job is intricately complex, and they’re often paid well due to the difficulty of the position. No matter where a project manager might work in the United States, the role requires a great deal of attention to detail, planning, foresight, access to the right tools and the ability to execute in order to rise to the top of the profession. However, like in any profession, where one lives can play a substantial factor in potential earnings throughout a career. By evaluating project manager salary data from Salary.com, we uncovered some striking trends in compensation for project managers at different times in their career, from entry-level to experienced, and across geographical regions. To best evaluate the strongest markets for project managers salary-wise, we also incorporated cost-of-living data into the equation to see just how far a dollar really goes. After all, if you’re making 25% more than someone with equivalent skills and experience to you one state over, but the cost of living is 25% higher, then what’s the point of just breaking even, when a better opportunity could exist somewhere else? The average project manager salary in the United States is $90,139. This number can vary widely, however, depending on location, experience, your project manager resume and any certifications the project manager has obtained. As might be expected, project management salaries rise consistently with increased levels of experience—and presumably, in most instances the attainment of a Project Management Professional (PMP) credential. However, these rises can be offset by the cost of living across states, more dramatically in some places than others. States like Missouri, Ohio and Delaware are great places to kick-off your project management career, with salaries in the upper 70s. Hawaii or basically anywhere in the Rockies? Not so much. One of the more interesting tidbits is that project managers in Ohio make $9,000 more on average and those in Indiana and around $6K more than those in bordering Illinois. There’s a similar phenomenon in Nevada, where PMs make close to $97K, but due to cost-of-living those nearby in Utah and California make around $7K less. These two are case-in-point that geography plays a huge difference in salary, even if the project manager job description is nearly the same. 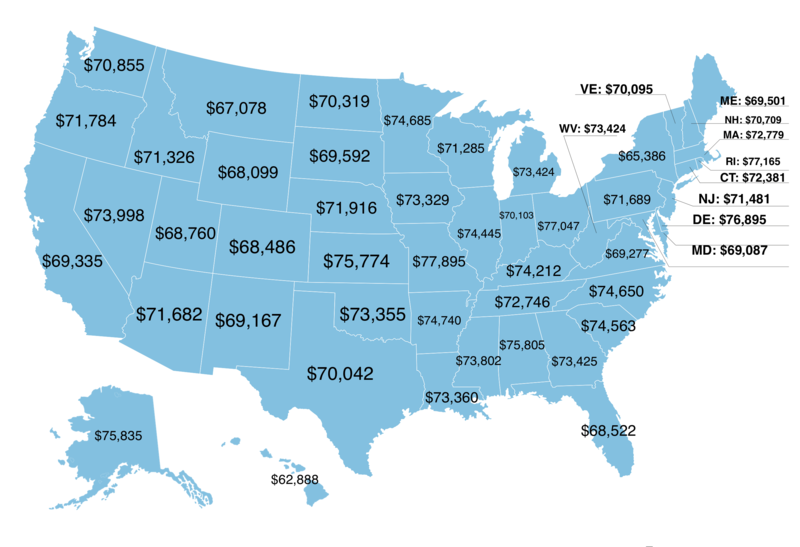 This affect on salary can even be true in your neighboring state, not just your region. Project management can be a lucrative career regardless of your geographical location given you earn solid on-the-job experience, and necessary credentials like Professional Development Units (PDUs) and the Project Management Professional (PMP) designation. Plus, if you’re willing to move around a little, and maybe even call someplace home you might not have otherwise, being a project manager can be even more lucrative. So, who’s moving to Missouri!? A project manager’s earned dollar goes the furthest in the southeastern U.S (think Louisiana, Mississippi, Alabama, Tennessee, Kentucky, Georgia, Florida, North Carolina & South Carolina). Entry and mid-level PMs in these states are the best-paid in the country. A prohibitive cost-of-living combined with lower salaries make the mountain states (namely, Colorado, Utah, Idaho, Wyoming and Montana) particularly difficult places to earn a strong living as a project manager. On the surface, by just evaluating raw salary numbers, New Jersey looks like the place to work as a PM (regardless of experience level). The catch? The state’s cost of living is so high the salary advantages it has over other states are offset. Hawaii’s extreme cost of living makes it the lowest-paying state for project managers at an average salary across experience levels of $81,202. A dollar is actually only worth a cost-adjusted $.84 cents in Hawaii, so even the highest salaries are flattened out by the cost of living. The sunsets aren’t worth the price, apparently. Alaska has the highest salary for entry level PMs at a cost-adjusted $98,003 per year. Chalk it up to the strong presence of the oil industry in the state and other weather-related factors. Maybe because you also have to deal with the sub-zero winters and semi-perpetual darkness? Not everyone wants to brave the extremes of the Alaskan climate, but those that are willing can definitely see the payoff. Interestingly, Missouri is the place to be if you’re looking to cash in. It’s the only state in the US where the average project manager’s salary is at least six figures. Want the big bucks? Get a project management certification. PMP certified individuals earn around 16% more than their non-certified counterparts. That works out to about $14,500 in real money. MBAs also have a positive impact on salary, more so than even a project management Master’s degree. You can see how the short term challenge of gaining a qualification will pay off over the course of your career. Time to hit the books! Stay connected with your peers. Networking is a fast and effective way to a new job. Join the largest PM-curated community on LinkedIn and build your professional network. Boost your knowledge with any of the articles, blogs and videos in our free project management resources. Subscribe to our weekly email to get the latest project management insights delivered right to your inbox. Of course, giving yourself the best project management tools available can help you advance your project management career as well. Try out ProjectManager.com and harness the power of online project management software, featuring interactive Gantt charts, task lists and project dashboards to help you get more out of your projects. Create your first project plan today with a 30-day free trial.